Belgian police are searching for a possible suspect who was captured on video at the Brussels airport. 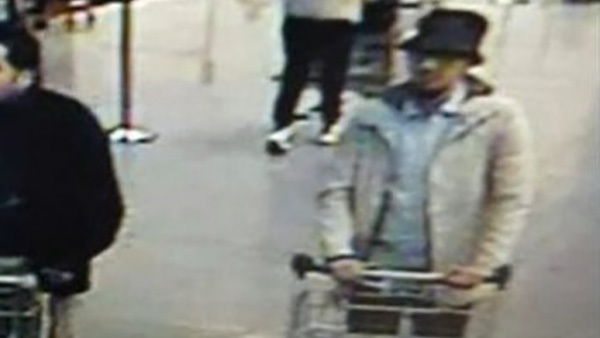 Belgian police are searching for a suspect who was seen on surveillance video at Brussels' main international airport. The photo, taken from airport surveillance footage, shows a man walking with a baggage cart through the airport. Two other men seen next to the possible suspect were "probably" suicide bombers, Prosecutor Frederic Van Leeuw said. The prosecutor said the third suspect is actively being sought by police. Arnaud Feist, the airport's CEO, has confirmed that there was a third bomb at the airport that did not explode. It was neutralized by police. Two airport blasts, at least one of them blamed on a suicide bomber, left behind a chaotic scene of splattered blood in the departure lounge as windows were blown out, ceilings collapsed and travelers streamed out of the smoky building. Three Mormon missionaries from Utah were among dozens injured at the airport. About an hour later, another bomb exploded on a rush-hour subway train near the European Union headquarters.